The skin is a theme that, once applied, radically changes the look of the gallery: colors, fonts, border sizes, etc. A skin is a .skin file provided with a folder containing all the necessary files: icons, wallpapers… On every gallery a theme must be applied. By default, it will be de “default skin”. The two buttons located in the Skin groupbox are used to open an existing theme and modify it or design a new one. Opening a .skin file is all you need to do in order to apply it on the gallery. If you want to design a skin, please refer to the article: Designing a Skin. The thumbnails are displayed on the index screen and laid out in a table of X rows and Y columns. NB rows / NB columns: defines the numbers of rows and columns forming the table of thumbnails. If there are more thumbnails than the table size, tabs will appear, allowing to navigate to the other thumbnail panes. The thumbnails are dynamically resized for the mosaic to best fit the visitor screen estate. These fields configure the way the photos will be displayed on the screen. EZWebGallery tries to maximize photo size, depending on how much space is available on the visitor’s screen. To reach this goal, EZWebGallery generates many pictures of various sizes from each photo in the input directory. The most appropriate will then be shown to the visitor. Max size – Horizontal / Vertical (pixels): Maximal size of the photos generated by EZWebGallery. If the visitor’s screen estate is bigger, this biggest photo will be displayed. Min size – Horizontal / Vertical (pixels): Minimal size of the photos generated by EZWebGallery. If the visitor’s screen estate is smaller, this smallest photo will be used, after being resized on client-side. Quality – (Optimize image quality / Optimize usage of screen estate): Defines the way the gallery will choose and process the photo to display, among all the differently sized versions. Optimize usage of screen estate: The gallery loads the photo immediately bigger than the available space, and then resize it in the browser in order to adapt it. On the plus side, the picture will match perfectly the screen estate. On the minus side, the quality of the resized photo is not optimal and this can vary from a browser to another. For instance, Internet Explorer 6 and 7 produce photos that can be pixelated or blurry and don’t keep straight lines… straight! Optimize image quality: the gallery will choose the photo which size is the closest to the screen estate, while still being smaller. On the plus side, the image quality is optimal and constant from a browser to another. On the minus side, there will be a minor loss of space. NB resolutions: number of differently sized photos which will be generated. The more photos generated, the better they will match the screen space. In return, the gallery will become more voluminous on your server. The following drawing illustrates which photo is displayed, depending of the visitor’s available screen space. If Optimize image quality was selected, Photo_2 will be displayed. 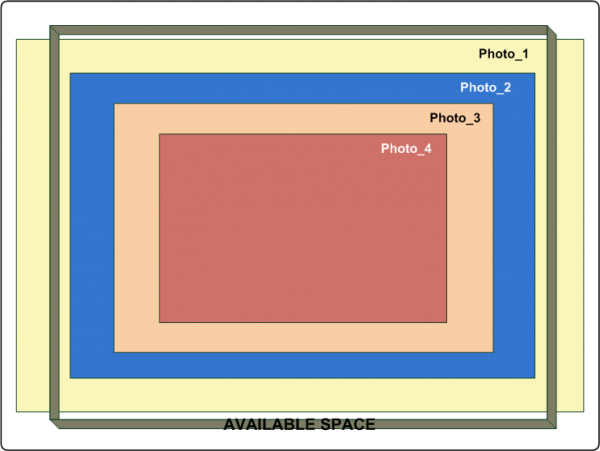 If Optimize usage of screen estate was selected, it will be Photo_1, after being resized to match the screen estate. EZWebGallery generates many differently sized photos and chooses the most appropriate for display. JPEG Quality (%): Linked to the compression ratio which will be applied to the photos. The better the quality, the more voluminous the files become. Below 70%, the compression artifacts might become visible. Note that the prefetching will hide most of the latencies, even if the photos to load are quite big. Sharpening radius (pixels): Some sharpening is applied to the generated photos in order to enhance the perceived quality, using the “UnsharpMasking” algorithm. A small radius value will only accentuate the small details. Be aware that beyond 1 ore 1.2 pixels, this postprocess migh become visible, making the photos look artificial. Sharpening amount (%): Intensity of the sharpening to be applied. 0 : no sharpening, 100 : maximal sharpening. A watermark can optionally be added to each photo. Type (Image / Text): the watermark can be an image or some text. Position: set the position where the watermark will appear. North means that the watermark will be centered on the top border of the photo. North-East means that it will be on the top-right corner and East that it will be centered on the right border. And so on. Orientation: the watermark can be rotated. Text: The text forming the watermark. You can use tags which will be replaced by some metadata embedded in the photos. For instance “(c)[EXIF:Year] MrPhotographer” will be rendered as “(c) 2013 MrPhotographer on all the photos shot during the year 2013. Font: the font used to render the text watermark. 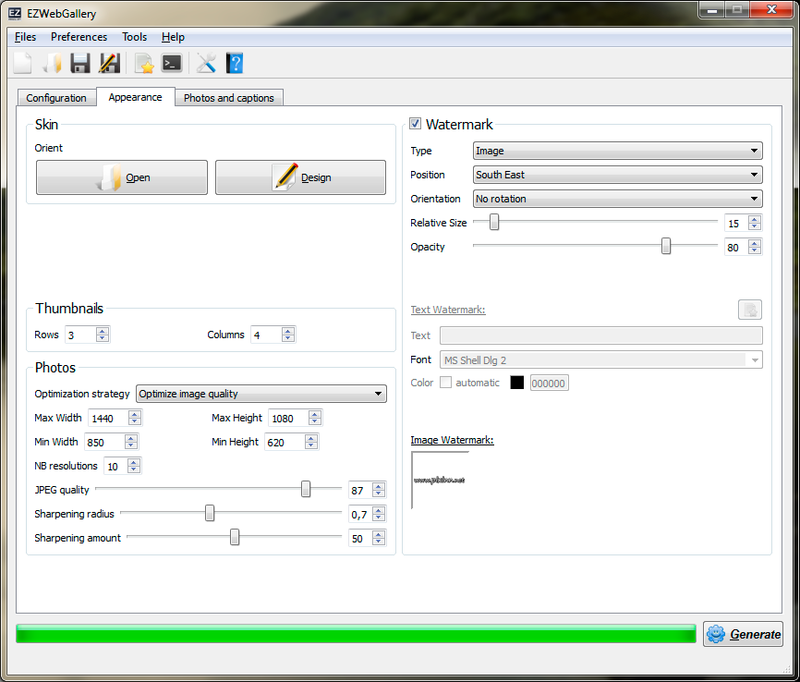 Automatic: let EZWebGallery choose the color (black or white) in order to enhance the readability. Image: choose an image to use as the watermark.